The Place After Honolulu Cafe and Tai Cheong Bakery, Tsui Wah (翠華) is the latest Hong Kong-style “Cha Chaan Teng” (港式茶餐廳) to open in Singapore. Located at 3A River Valley Road in the buzzing Clarke Quay, this is Tsui Wah’s first Southeast Asia outlet. A joint venture between Tsui Wah Holdings Limited and Jumbo Group Ltd, the space of Tsui Wah Clarke Quay is quite spacious, with a seating capacity of 140 for both indoor and alfresco sections. The gold and green interior of the seats remind me of the teahouse setting in Hong Kong, especially so with the Cantonese music playing in the background. 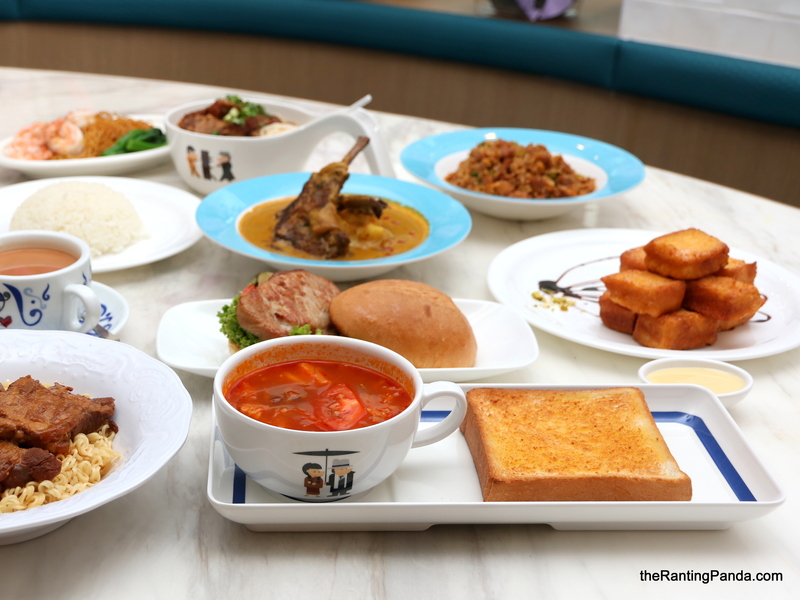 The Food With over 60 outlets in Hong Kong, Macau and China, some of the signature items to expect include the Milk Tea, Crispy Bun with Condensed Milk, and the Curry Series, among others. Some of the chefs from Hong Kong will also be stationed in the Singapore branch to ensure that the food is consistent with other outlets. I also understand from a spokesperson that the menu at Tsui Wah Clarke Quay is about 80-90% similar to the offerings in Hong Kong. I started with the Borscht with Thick Toast (S$5.50), where this dish is prepared daily from the original Tsui Wah recipe of more than 30 years. Stewed for about 3 hours, the soup is rich in flavour with small slices of tender beef and is good on its own, though my recommendation is to dip the crispy toast into it for a better flavour. No visit to a teahouse is complete without ordering the “Ju Pa Bao”. The Tsui Wah Signature Pork Chop Bun (S$7.50) comes in a generous portion where the thinly glazed pork chop is stuffed between the thick toasted bread. I find that the pork chop is quite good on its own, and is definitely on a par with the ones from Hong Kong. The Kagoshima-Style Pork Cartilage in Fish Soup with Mixian (S$9.50) is surprisingly good. I am in love with the rich fish soup, while the pork cartilage is relatively tender as it is stewed for many hours. Another style of having the pork is with instant noodles, hence the Kagoshima-Style Pork Cartilage with Tossed Instant Noodles (S$9.50) is a better option if you have always been a fan of Nissin noodles. I personally find this version more hearty, and there must be some magic to make the instant noodles here taste so delicious. This dry version is also served with an accompanying fish soup. One of the top ten most popular dishes at Tsui Wah, the Braised Abalone Rice with Diced Chicken and Kale (S$14) is a mixed one for me. The rice is very fragrant and moist, though the consensus on the table is that it a tad too salty. For lamb lovers, the Lamb Chop Curry with Steamed Rice (S$29) is full of carbs to begin with. Served with a plate of white rice, there is also a generous serving of mashed potatoes beneath the huge lamb racks The curry recipe dates back to the 1960s, where the signature curry is stewed for over 6 hours with more than 30 spices where the curry paste is imported from Hong Kong. The New Zealand lamb is quite tender without much gamy taste, while the curry texture is very thick and is prepared with beef elements as well. I didn’t quite fancy the King Prawns in XO Sauce with Tossed Noodles (S$11) as it pales in comparison to the other dishes I tried in terms of flavours. That said, the way to enjoy this dish is to pour all the XO Sauce into the noodles, which is served along with fish soup. The fish soup is quite comforting, with a tinge of peppery flavour. Another dish I strongly recommend is the Crispy Bun with Condensed Milk (S$4). Simple ingredients where the buttery bun here is the star, and goes perfectly with the condensed milk for a sinful treat. Have this as a snack with your hot Milk Tea. For dessert, the Savoury French Toast Bites (S$9.50) served with Vanilla ice cream is good for sharing between 3-4 persons. The bite size cubes are deep fried to a golden crisp texture, served along with condensed milk which you can drizzle on the toast. The texture of the toast is good, though I actually enjoy the vanilla ice cream more. Lastly, don’t leave without trying the Hot Milk Tea (S$4) which uses imported tea leaves from Tsui Wah Hong Kong. Prepared with evaporated milk and no sugar when served, the milk tea is good enough for me even without adding any sugar. Rants Even though the seating capacity outdoor is relatively big, I’m not so sure about dining outdoors during the day which will be definitely be a less pleasant dining experience for me. Will I Return Again? I have no doubt Tsui Wah will be a hit in Singapore. The prices are very reasonable especially in a touristy and prime location like Clarke Quay, while the dishes are generally comforting and simple. No qualms to be back for me should the queue be manageable. This was an invited tasting, though all opinions expressed are our own. Food is over rated. Tea was horrendous. I will not go again. Seems like the restaurant has some consistency issues to iron out! Isan style steak? What took us so long to come to Supanniga? Food quality is consistent across the dishes we had, prices are reasonable and they have various outlets across Bangkok. Thanks to one of our follower for dropping us this recco and insisting we have to give it a try! Our favourite new cafe in Bangkok so far! Rustic yet a blend of old school and modern interior, the two-storeys space of @Sarnies.BKK is gorg! Coffee on point, with beans roasted in Bangkok. Food options aplenty too. Must come! Roast duck noodles for breakfast! Headed to this decades old eatery near Saphan Taksin and we must say the roast meats and char siew are pretty competent. The egg noodles itself is delicious too! Seats are limited but it is easy to share a table with others, good morning! Roasted duck, nutmeg and coriander on crispy rice cracker! One of our starters at @PasteBangkok lunch menu, the dishes on an overall basis are consistently good with strong flavours in execution. Paste is Number 28 of Asia’s 50 Best Restaurants 2019, and it is also One-Michelin Star. Perhaps our only gripe is the stiff service, which is also what we feel from our previous dining experience at R-Haan. How’s your end, my side is ok! Quiet and rustic cafe tucked away in a small alley, very reasonably priced brunch fares and surprisingly competent Kyoto matcha latte. Always excited to explore the food in this city! Good morning from Bangkok! Checked out this 3 weeks old cafe in Sathorn, and we really love the rustic and woody space here! Tried both the fruity and nutty beans , and we preferred the stronger nutty blend of Brazilian and regional beans. There will be a couple of restaurants which we are looking forward to trying this trip, stay tune! Food Review: Beauty in the Pot opens Third and Largest outlet in Singapore | Pretty Pink Interior Theme at OneKM Mall (again)!